VALDOSTA – The Environmental Health Program at Echols County Health Department was recognized for their outstanding commitment to continuous improvement. The program received a Certificate of Achievement from the Food and Drug Administration for completing a self-assessment of the FDA Voluntary National Retail Food Regulatory Program Standards. 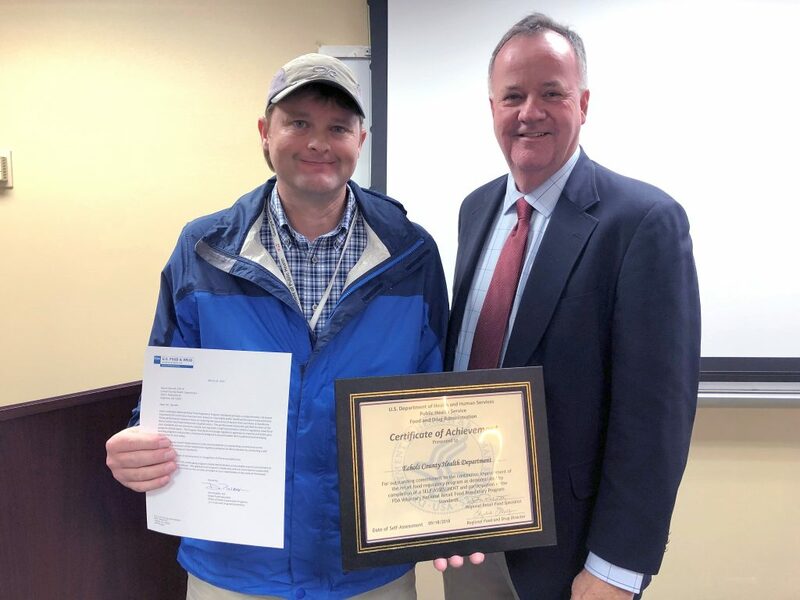 Dan Reddit, FDA Retail Food Specialist, presented the certificate to Aaron Darnell, Environmental Health Specialist IV, during the Lowndes County Board of Health meeting March 26. The award recognizes Echols County’s Environmental Health Program for their commitment to achieving program excellence. “We are proud of our team at Echols for their continued commitment to improving. These assessments and improvements will allow our environmental health teams to continue to serve our communities at the highest level possible,” said District Environmental Health Director Chris Calhoun. All ten South Health District counties are enrolled in the FDA Voluntary National Retail Food Regulatory Program Standards. Echols County was the first county in the district to complete their self-assessment.